It’s a damned shame. London being a ‘world city’ obviously entails removing every vestige of its character to ensure that what remains could be any urban sprawl, anywhere in the world. property developers are removing the beating heart of a creative and successful economic community in transforming these historic terraces into luxury living space for the well-to-do. I am stating the obvious, I know but capital is draining the atmosphere out of London like a relentless succubus. Another sad story about an area of London known for it’s trade or profession being trampled all over by greedy developers. Why can’t these companies be more sympathetic to the people making a living, albeit a fairly meagre one within these areas? I know it’s the bottom line and that they need to maximise every square inch but for the sake of what? These places have grown organically and are a little untidy but they are what makes our city interesting and different. I have never visited Dubai and have no intention of doing so but I don’t want it busing me. Progress? I think not. One of my books was photographed recently in just such a little workshop. 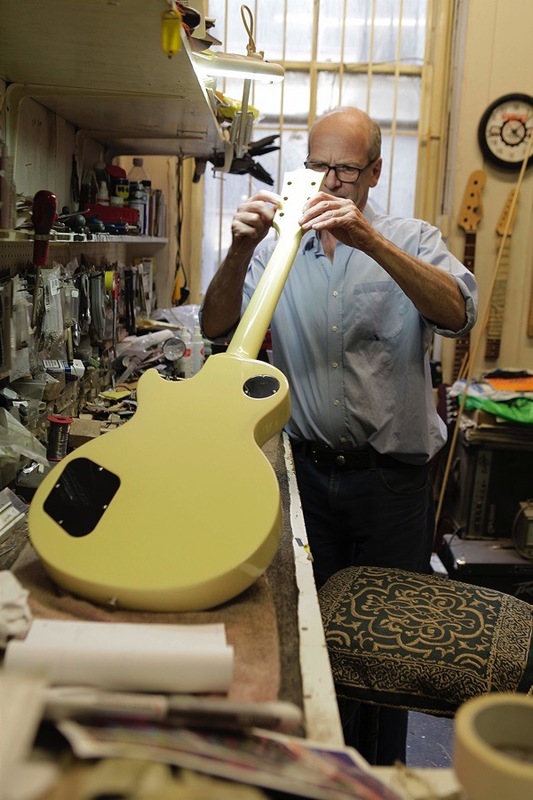 These craftsmen have always been undervalued and yet without them much music would not be made. Progress should be about developing the human spirit not the bank balance of developers. Denmark St needs to be valued not undermined. 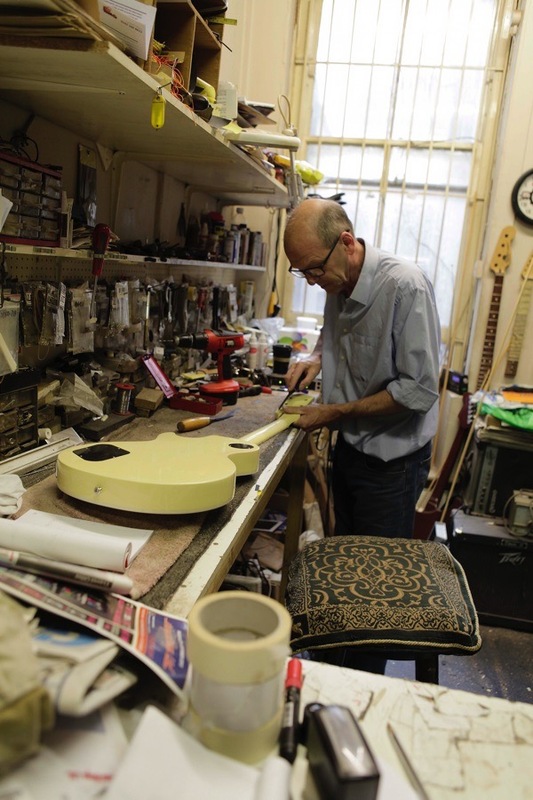 Paul Balmer – AMAZON’s No.1 best seller in ‘Guitar’& BBC Music Day ‘Unsung Hero 2015’. I know exactly where his store is. It’s in the same block of Denmark Street as a restaurant we enjoyed on a recent trip to London. Sorry to hear this. 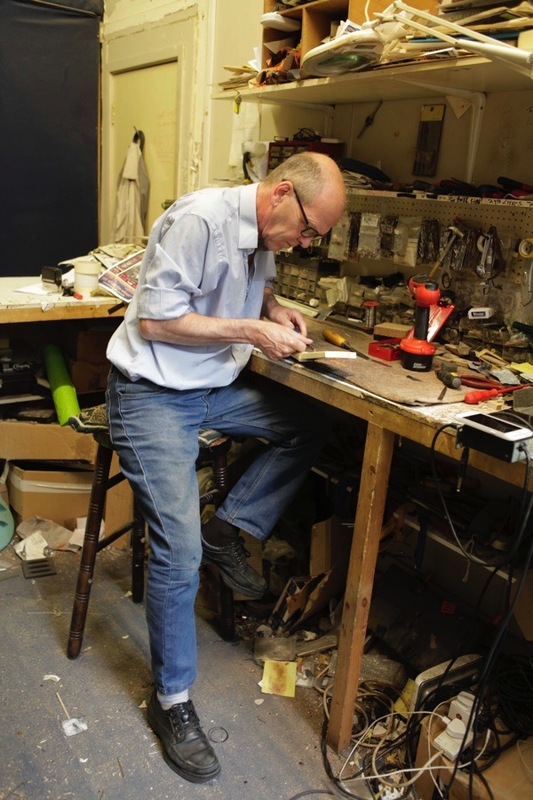 GA, really enjoyed reading about Tim Marten and how he developed his skills as a craftsman since boyhood. Sounds as if he has had an interesting life on the road too. Excellent article, informative, entertaining and well written. Great shame the workshop is being culled to make room for luxury homes. 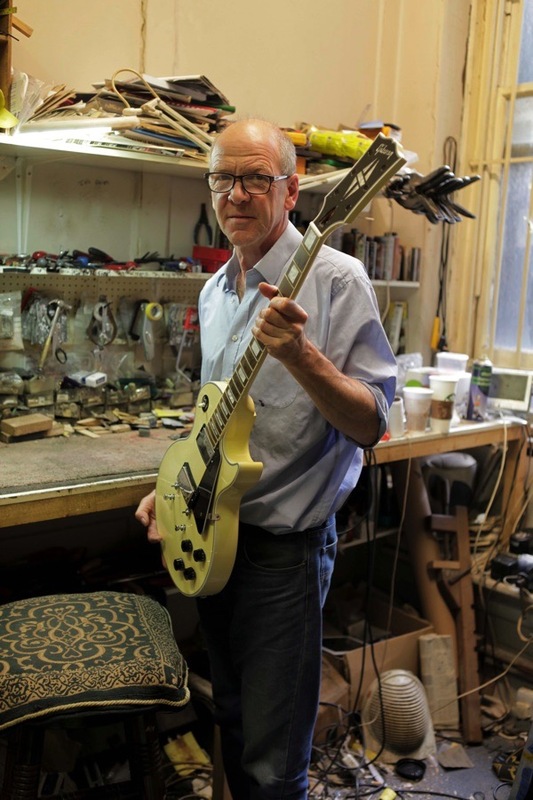 Isn’t it about time people like Tim and others who love their occupation within the world of guitars and gigs, got together and formed complimenting consortiums away from down town London to somewhere more accessible and affordable? I wish Tim all the luck in the world, I know from personal experience just how it feels to be forced to leave the premises that have been home to your business for many years, but I hope that the fates will be kind to Tim, as they were to us, and that he will find new premises that he will be happy in. It is a very sad situation in Denmark Street obviously and it is another shocking example of the greed that prevails in London at the moment. Your account of Tim’s business reminds me so much of my lovely cockney grandfather’s workshop where he made all kinds of stringed instruments; ukuleles, banjos, guitars and dulcimers were always there and the wonderful smell of freshly cut wood, varnishes, paints and glues, all combined into a heady mixture, comes back to me now, and I love it !! I still have the dulcimer that my grandfather made for my aunt and it is one of my most treasured possessions. Thank you once again GA for bringing back such happy memories to me. 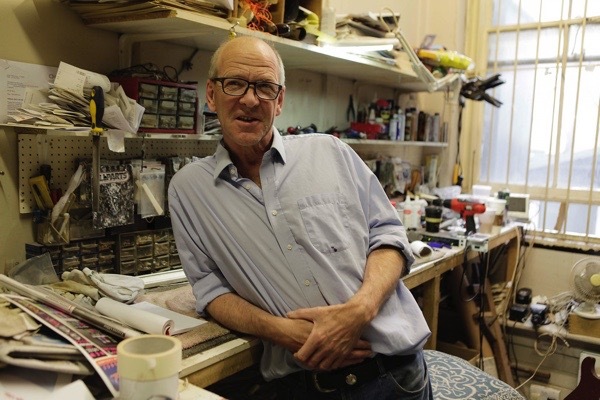 Denmark Street is one of the few corners with any recognizable character left around Tottenham Court Road. Those slightly crooked houses are like something out of Harry Potter. Actually, JK Rowling’s private eye Cormoran Stike has his office there, not a coincidence. A real shame to see it all turned into soulless “Luxury Flat” shells. Good luck Tim. Hope it all works out for you. Are you related to Elvis Costello? 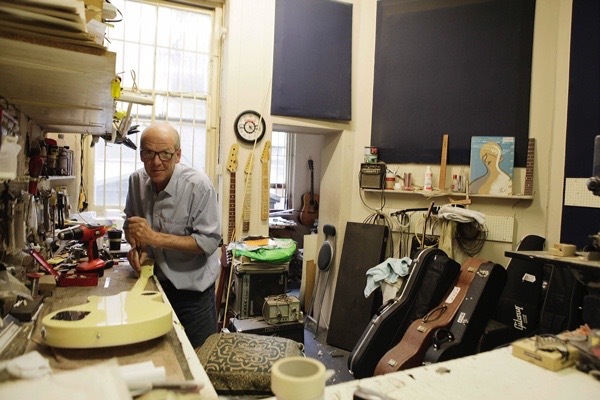 What will the owners of the luxury flats know of the rich history of Denmark Street? They may think they have bought into this history & are part of this aspect of London’s music culture. Alas, they will have bought a hollow shell in a street full of ghosts they will never see, hold or own. They will have contributed indirectly to the loss of the street’s unique character because the developer knows the price of everything & the value of nothing. Anyway, while I was gazing at the Luther’s immense skill, Tim was looking at an Ovation I had brought in as it would not play through an amp & I feared neglect had done for it. Tim asked me what the ragged cushion was doing in the sack I had brought it in I blushed & said someone has to try to protect it cos no one else was. A bin liner & a cushion. Did I feel stupid…..? Tim told me to go out and buy a good Duracell battery which he surgically replaced with an ancient one I didn’t even know was in there. I bought the best case Andy had downstairs, Tim just happened to pop down just then, I think he approved. Later Tim set it up for me advised me what strings to use. Why am I going on about this? it’s a damn crying shame that Tim had to move. Money, £’s, $,s, Pence, Granny’s tin tea caddy artfully hidden up the fire place nook, for a rainy day’, ie; for me to nick the price of some sherbet pips. I am so sorry to hear about this Tim, truly. I looked you up because I’ve gone & broken my Bass guitar neck, in true rock n roll manner, a collision with a ladder doing 30 with her trolley in Waitrose. Can I find you anywhere else Tim? This is a serious S.O.Bass signal. With very best wishes for the future. Denmark & Wardour Street was a once a week treat for me till i got ill. Even my Daughter got to enjoy it, or was it the Chinese food?